Sunset Park represents one of the best opportunities to learn of Brooklyn's rich history and complex, multi-ethnic present, with its Chinese- and Latin-American populations. 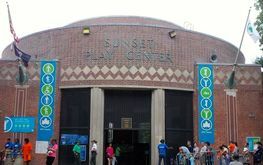 While the neighborhood's namesake park, with its WPA-era pool and recreation center, dates back to the 19th century, the neighborhood of Sunset Park, until the 1960s, was divided into South Brooklyn (mostly) and Bay Ridge. It grew with immigrants from Ireland, Italy, Norway, and Finland, leading to institutions like the massive Our Lady of Perpetual Help basilica, the Lutheran Medical Center, and the first co-operative apartments in the United States. Sunset Park supported the city's pre-eminent port, but the post-World War II decline in shipping, as well as the Gowanus Expressway ushered in by Robert Moses, led to deterioration and decay. As older white ethnic populations left, Puerto Ricans came for the factory work, followed by other Spanish speakers from Central and South America. Thanks to community organizing, continued immigration, government-supported housing rehabilitation, and better policing, Sunset Park began to revive, with in influx of newcomers and new investment. In the 1980s, the city's third major Chinatown developed, centered around the N train stop at 8th Avenue and the lagging Scandinavian shopping strip. Just recently Brooklyn's Chinese community--centered in Sunset Park but spreading south and east--was named the city's most populous. With its large complement of row houses--the largest National Register historic district in the northeast--Sunset Park has long been seen as a gentrification frontier. At the same time, it is New York City's second-most crowded neighborhood, as rising rents force struggling families to double up. That also means crowded schools, a deficit in park space, and environmental justice struggles. Fifth Avenue in Sunset Park has a largely Latino flavor, while Eighth Avenue is mostly Chinese. Both are worth seeing, along with the Fourth Avenue corridor, the park, and more. While this tour is not billed as an eating tour, there are a number of opportunities for snacks, from sidewalk vendors, dumpling houses, taquerias, and bakeries. An optional extension to massive Industry City, to the west of the highway, takes in a vast complex undergoing renovation (including the practice facility for the Brooklyn Nets, which opened early 2016). Industry City too has proceeded with both praise and controversy.